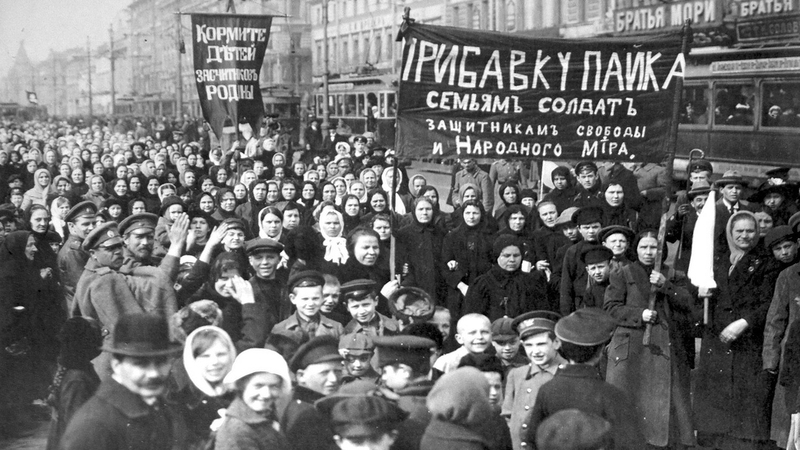 Street protest during the Russian Revolution of February 1917. The nearest banner demands more food for soldiers’ families. It is tempting to simplify an immensely complex situation along the lines that tsarist Russia had lost not only public respect, but also the authority and will to govern. The defeats and losses of 1914– 16 on the Eastern Front had been too great. Notwithstanding the false dawn of the Brusilov offensive [of June 1916], there was a widespread suspicion that either stupidity or treachery lay at the root cause of Russia’s ills. The Tsar had done himself no favours in assuming the mantle of commander-in-chief of the army. By distancing himself at his supreme military headquarters, the Stavka, at Mogilev, far away from the politicking, rumours and intrigues of St Petersburg, Nicholas II had not appreciated the extent to which his German-born wife, Alexandra Fedorovna, had undermined faith in the Russian monarchy through her dubious dealings with the highly controversial spiritualist Rasputin. After three years of war, Russia found herself in an extremely exhausted and volatile condition. Yet perhaps the biggest contributory cause of Russia’s fragility was economic rather than military. Intense industrial mobilisation had brought about an overheated domestic economy, which could not balance supply and demand. As peasants deserted the land for the towns and cities seeking far better paid employment in munitions factories, agricultural production slumped. The railways could not cope with both military and civil requirements. As food and fuel became short, particularly in highly industrial centres such as in Petrograd (St Petersburg had been so renamed in 1914), inflation soared as did widespread deprivation and disaffection. When the troubles reached breaking point, Russia’s brittle institutions of state possessed little resistance to the combined shock of mass unrest and military rebellion. In my next excerpt from Sevastopol’s Wars. Crimea from Potemkin to Putin (due to be published on 20 April 2017), I shall describe the reaction of the people of Sevastopol to the news of the abdication of Nicholas II on 15 March 1917 and the subsequent creation of the Provisional Government. Sevastopol had been one of the centres of the 1905 revolution – what role would it assume in 1917 and in the years immediately to follow?